The 3-person Climb-N-Dangle stationary climbing tower brings the excitement of rock climbing to your facility. It has a sophisticated, understated shape that mimics rolling granite or sandstone. 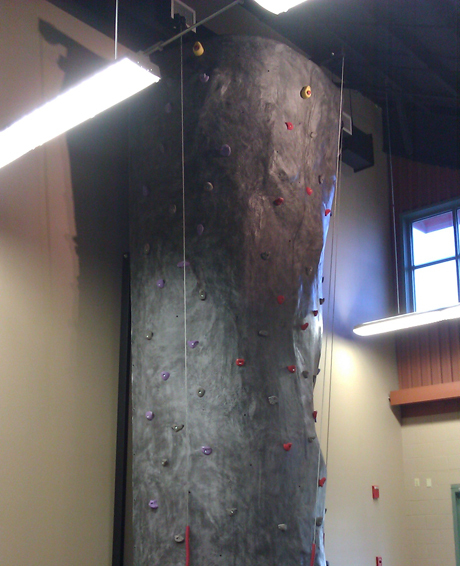 Kids love the way it looks, and operators love the many features packed into this rock climbing wall. The Climb-N-Dangle is constructed of a seamless, hand laid fiberglass surface and solid steel frame for unsurpassed strength and reliability. Custom heights are available up to the standard 24′. It can be installed as a freestanding feature or secured to a wall. The Auto-Belay allows one employee to supervise all 3 climbers at once for maximum through put. The Climb-N-Dangle is perfect for Family Entertainment Centers, Camps, Schools, or wherever else you need an extreme climbing solution!